One tip I had from a lot of people when I visited Portugal last year was to check out nearby Sintra while I was in Lisbon. 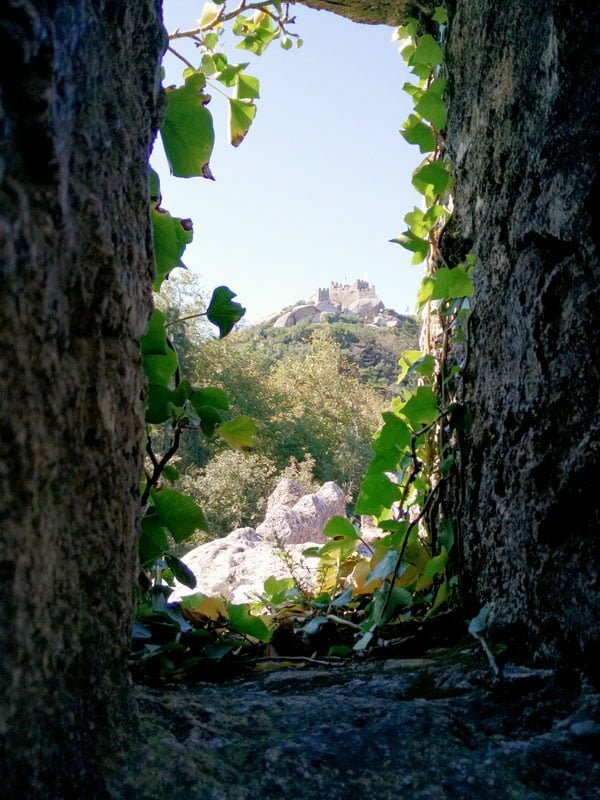 Sintra is a small UNESCO World Heritage town that’s less than an hour away by train from Lisbon’s city centre, and it’s a popular day trip option for those who want to leave the buzz of busy Lisbon behind for history, green hills and fairytale-like castles. Kinda quaint, and is that a castle of some sorts right up there? Read on for more. I’d done a little research beforehand and planned the day trip on a Monday, where lots of tourist stuff in Lisbon tends to be closed. We ended up making an unexpected detour to Cabo da Roca, but all in all it was a pretty fun trip. 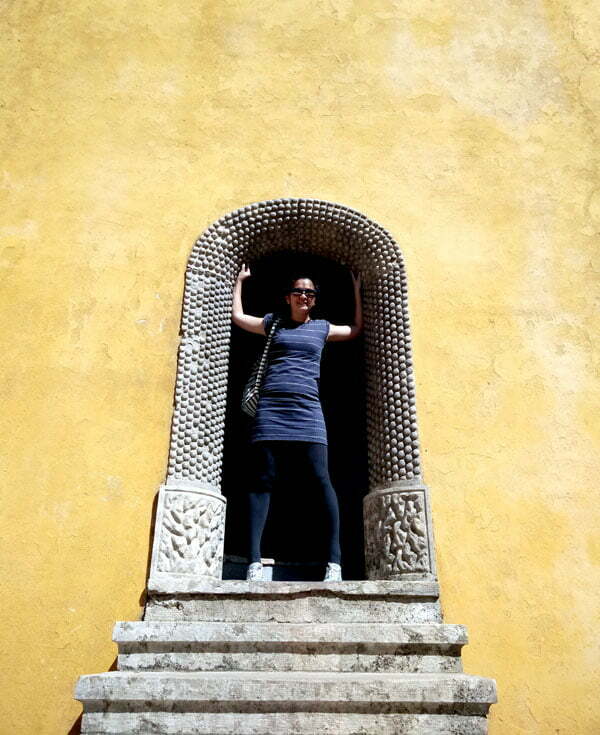 Here is a rundown of what I saw there, and some tips for planning your own Sintra day trip. You can also check out all my other Portugal posts to see where else I went on this trip. 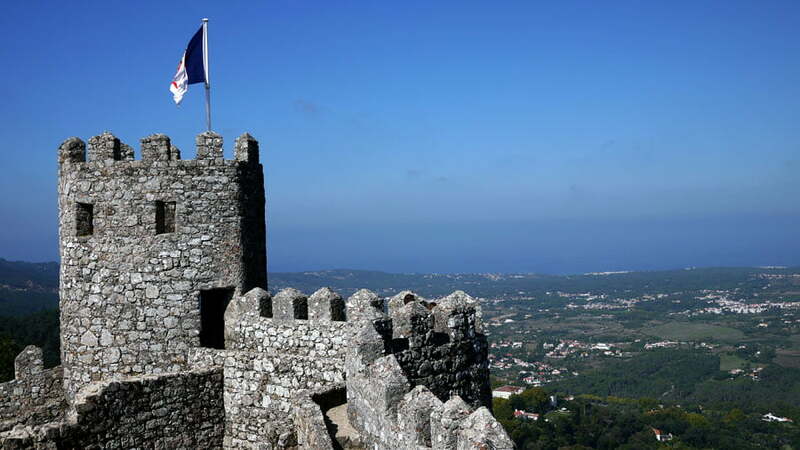 Finally at the walls of the castle, you are rewarded with an amazing panoramic view of Sintra and its surroundings. Absolutely worth the walk for! 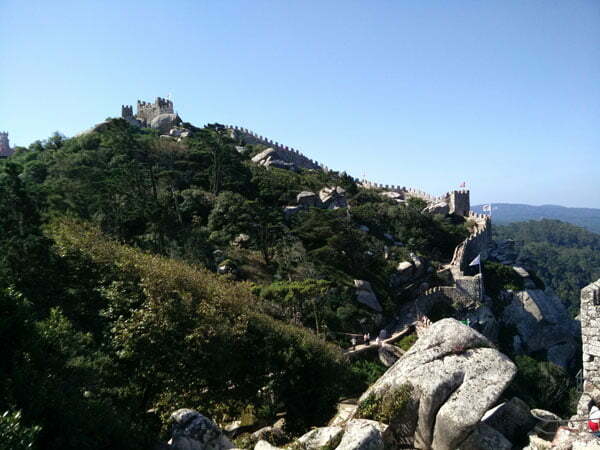 You can sit in the turrets of this old fortress and enjoy the magnificent view, and walk the length of the walls to reach its highest point. 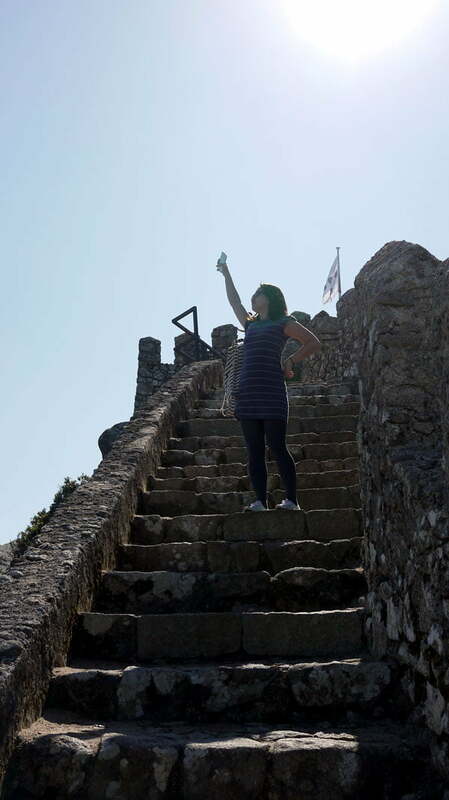 Again I reiterate, there is A LOT of climbing involved on old narrow stone stairs, make sure you have some good walking shoes, pace yourself and just take the time to soak in the view. See that tower on top? Yeah that’s where we eventually made our way to! We are about… halfway along the wall at this point? 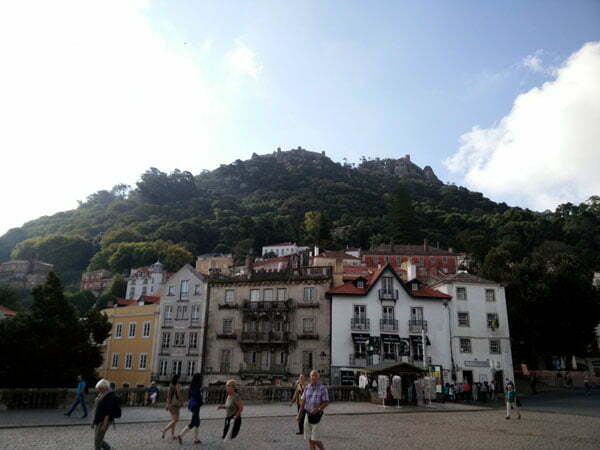 After the Moorish Castle, we take a 10min walk upslope towards the Palácio Nacional da Pena (National Palace of Pena) – you could hop onto the bus 434 again if you’re feeling tired but it’s not that far off, really. You can’t quite miss the distinct bright hues of the palace walls, making it seem almost toy-like from a distance. Once more, slopes abound as you make your way from the entrance to the palace on top of the hill. There is a bus within the palace compound to take you up the slope but it costs a little extra and I honestly don’t think worth paying for unless you really need the help. 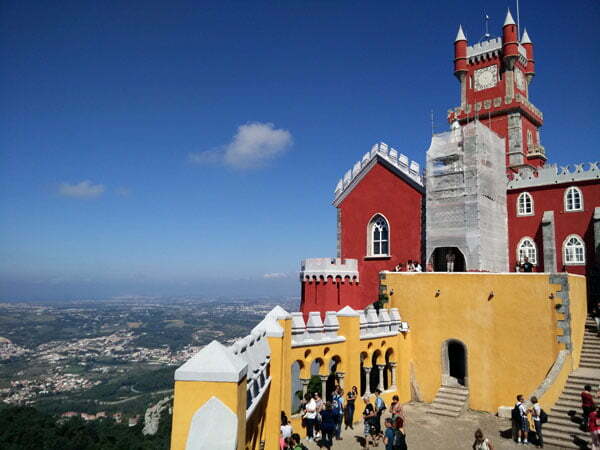 The Pena Palace is the 2nd highest point in the Sintra hills, so you’ll have an even more panoramic view (if that is even possible) of the surrounding areas. 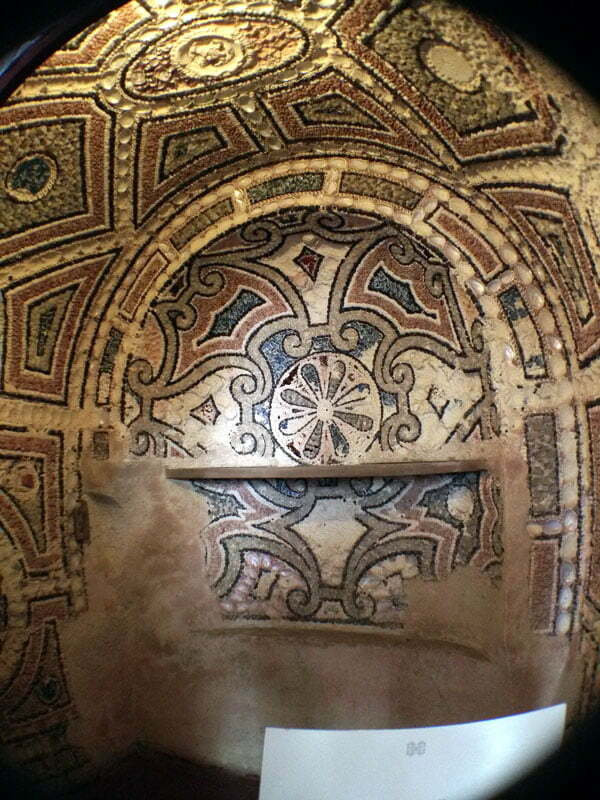 There’s a ledge around the outside of the palace where you can walk around. Earlier we were at the Moorish Castle which you can see in the distance. Can you see just how much walking we must have done?? 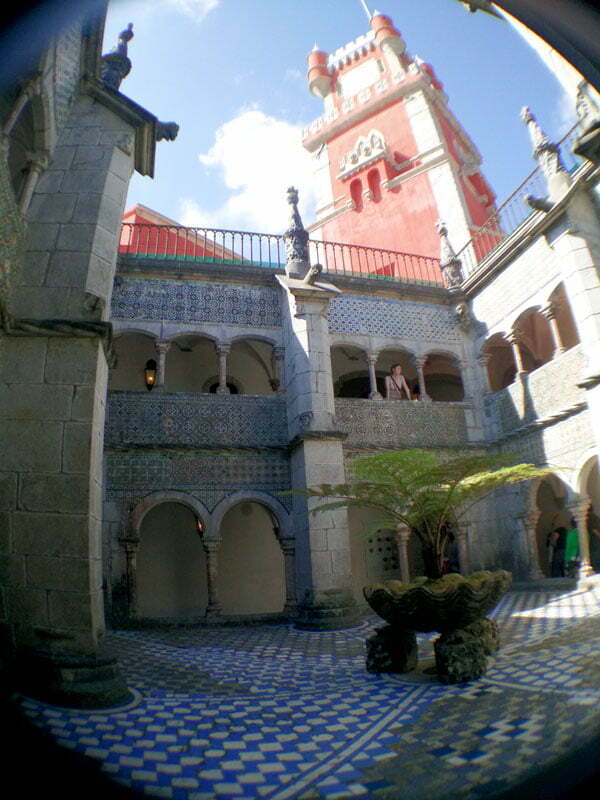 After walking around the outside of the palace, take a stroll inside the compound because the interior is super intricate and is a great mix of that Gothic Manueline (similar to the Jeronimos Monastery in Belem) and the colourful Moorish styles. 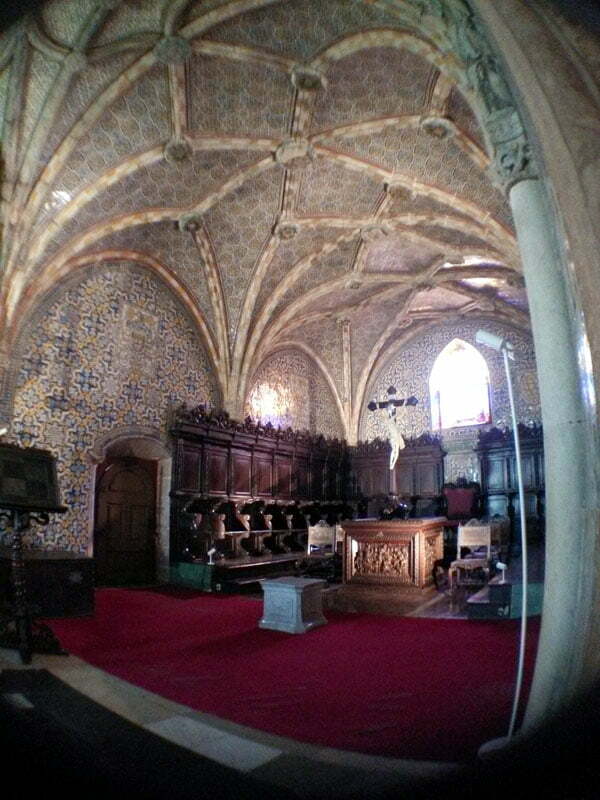 This was the summer palace of Portuguese Royals back in the day. 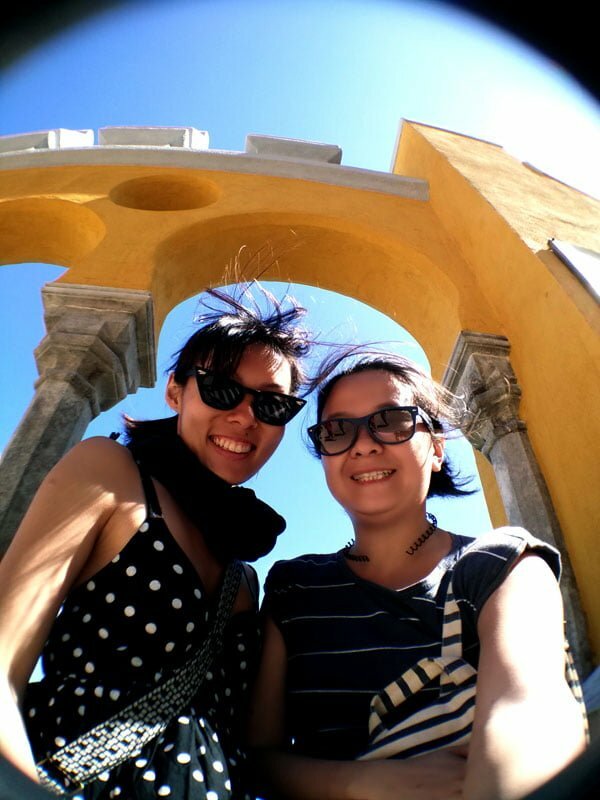 After visiting these 2 places, we decided to head to Cabo da Roca, the Western-most point of the Europe/Asia landmass which you can read more about here, and then from there we headed to Cascais and then back to Lisbon at night. 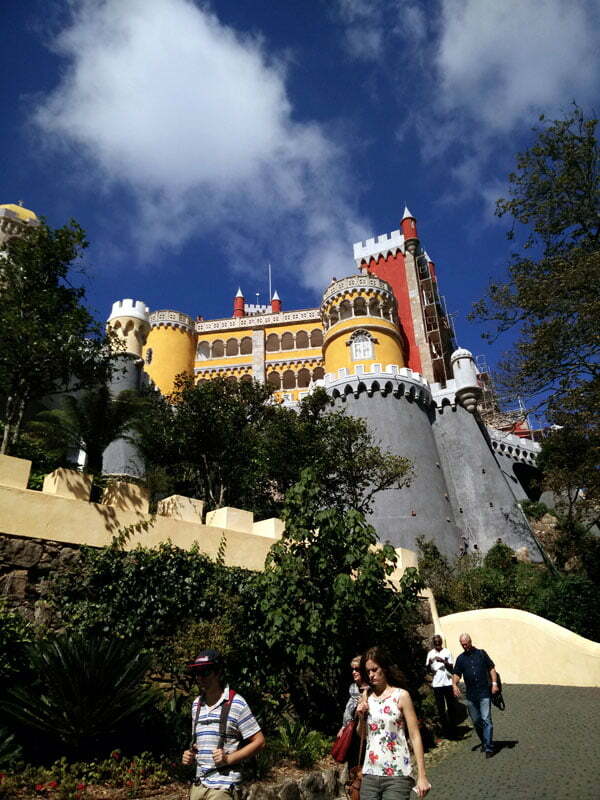 Sintra is around 40mins by CP train from Lisbon. 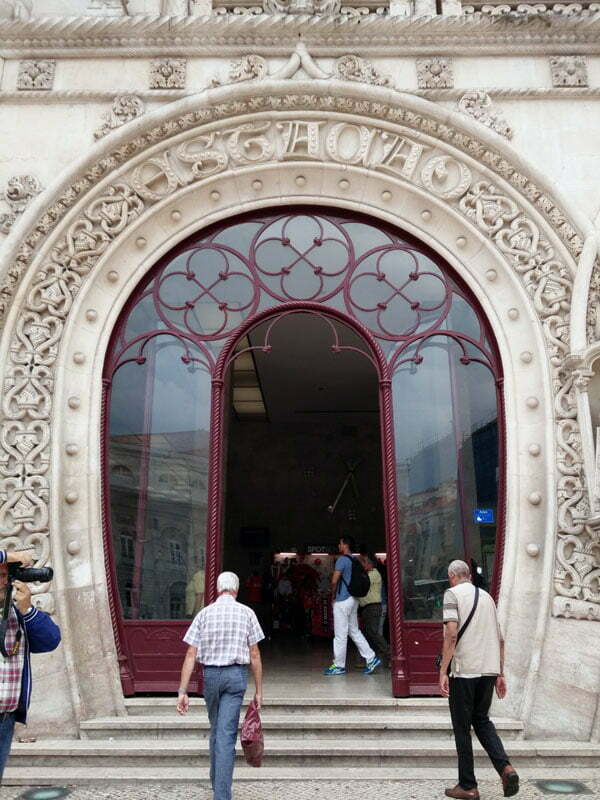 There are frequent trains that leave every hour from Rossio Station (the ornate station right next to Restauradores). 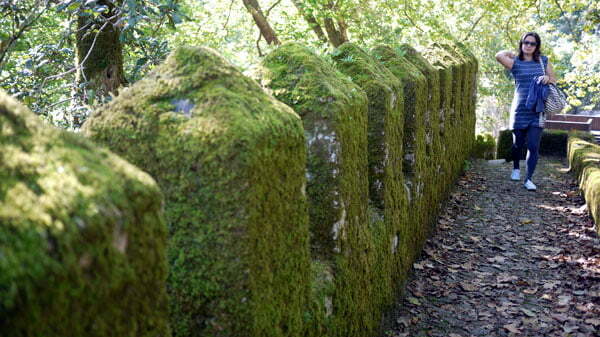 From Sintra’s train station, you either take the Scotturb bus or a slow walk (15mins or so?) to the historical centre where all the action is. 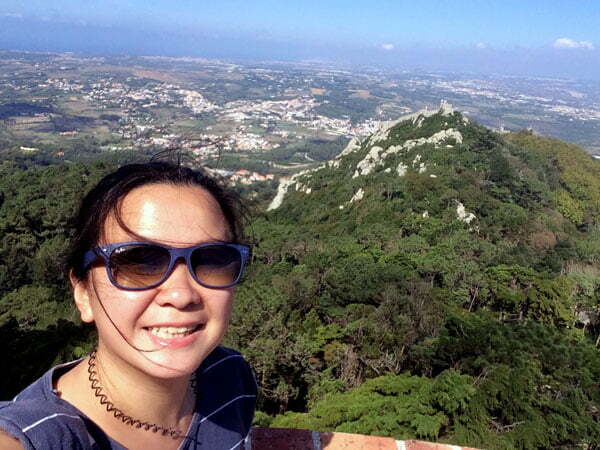 We reached Sintra about 10am-ish and visited the Moorish Castle and Pena Palace. It was about 3pm-ish when we headed off to Cabo da Roca. You can drive as well – though parking is a bit of a headache in the historical centre with very limited lots and the roads in the hills are quite narrow, but it’s one way to avoid the often crowded buses that result in you either having to wait for the next bus (Europeans aren’t big on squeezing Asian-subway-style) or standing precariously as the bus winds its way around the hills. Driving gives you much more flexibility when headed out of the city centre and it’s much more pleasant in the hills with less traffic and you don’t get stuck waiting around. We waited over an hour for the bus from Cabo da Roca to Cascais… not fun! 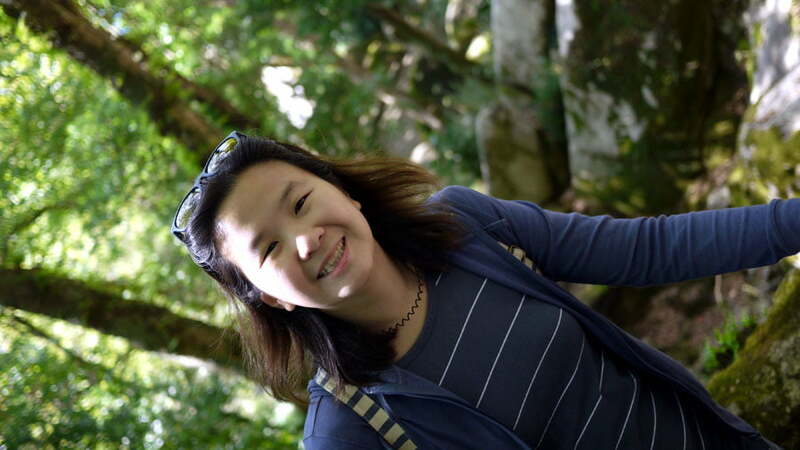 Here’s what I spent – happy to hear if anyone else has better ways to save some money! 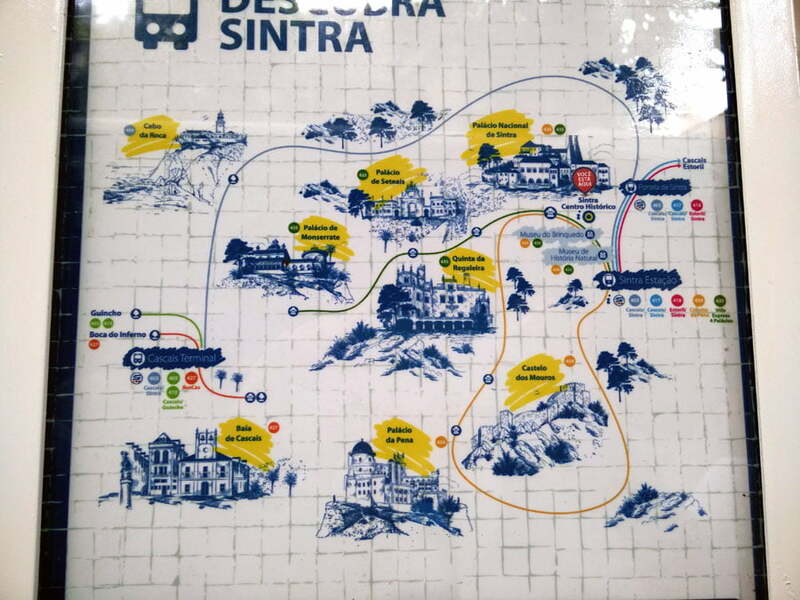 1-day Bus/Train Pass (buy from Rossio ticket office) – 15 euros – this covered the CP train rides Lisbon(Rossio)>Sintra and Cascais>Lisbon(Cais de Sodre), as well as the various Scotturb bus rides within Sintra, to Cabo da Roca and finally to Cascais. For Bus 434, a single loop ticket (hop-on/hop-off) costs 5 euros while a single trip (from point A to point B) costs 3 euros. See this useful guide for details. Thanks SO MUCH for all this awesome information! 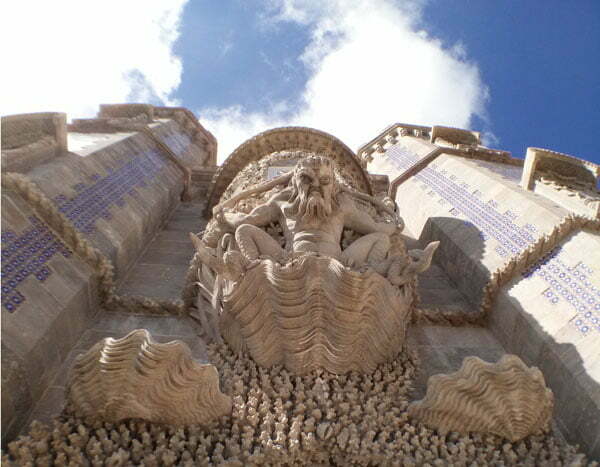 I’m heading to Lisbon this weekend, and Sintra is high(est?) on my agenda. While it appears the costs have increased since your trip (based on what I’ve been seeing online today, this gives me a good idea of the must-see/do items……as well as pitfalls to avoid. Sintra is very beautiful indeed and I’m pretty stoked for you :) Yeah inflation has probably upped prices but I’m sure you’re gonna have a great time… guess I gotta go back again so I can update this post accordingly, but you are welcome to share your updates here if you want :P Have a great trip! 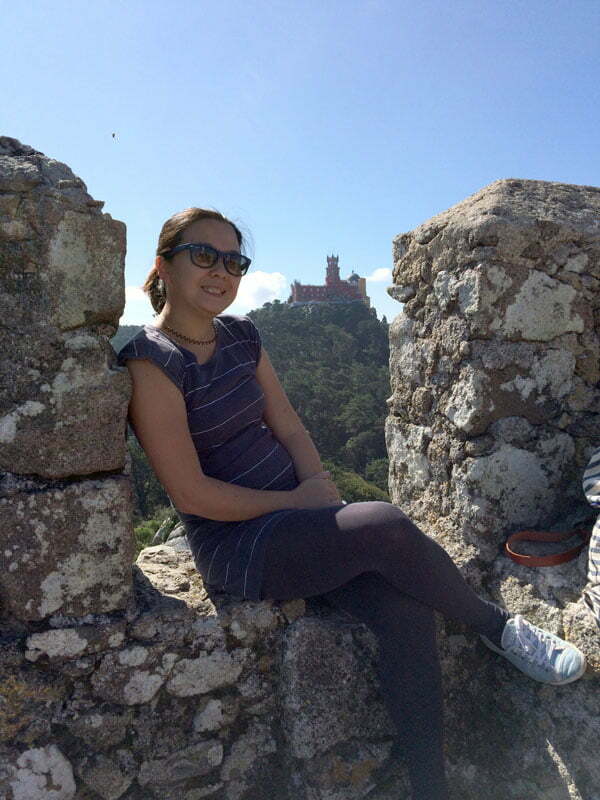 Sintra, what to say? It’s always stunning :) Whenever I can, I’ll go there. Last time I had a romantic walk in Colares with wine tasting and we still had some chocolates. 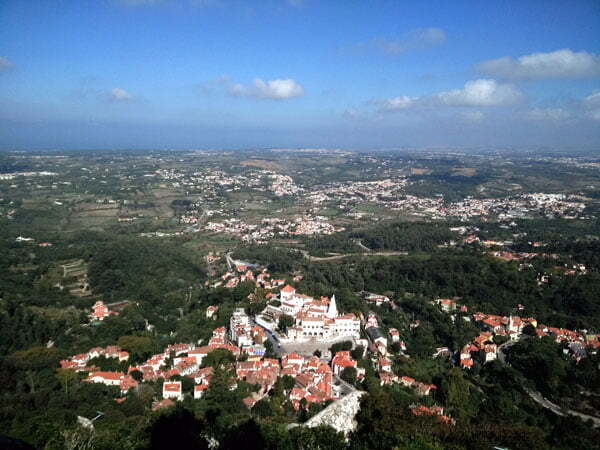 We walk through the town of Sintra and the vineyards of Colares. The whole area is a paradise. I always think that one day I would like to live there, in that romantic stillness. I definitely want to go back to Portugal again some day, thanks for the tips! 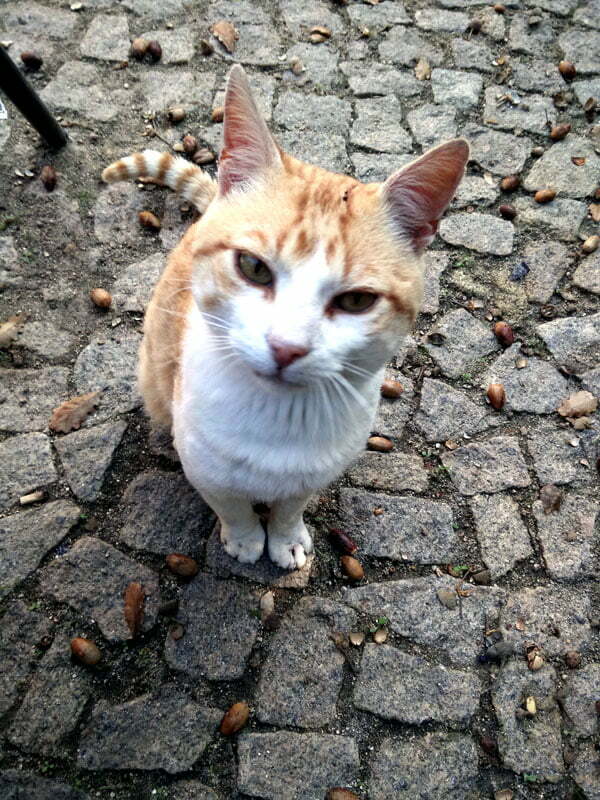 Loved reading about your time in Sintra! 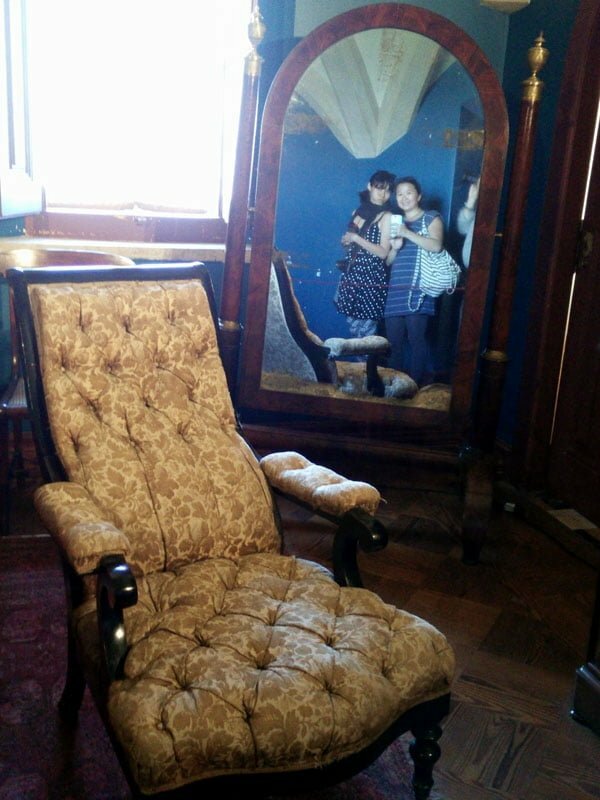 We did a day trip from Lisbon as well, and due to the constrained timing of our guided tour, chose to ditch sightseeing at the Palace for shopping and eating! I would highly recommend the cork products and filigree jewelry unique to Portugal and the famous pastries at Piriquita.